Since 1921. For over 80 years, Diamond Bakery has been making people smile with our onolicious (delicious) crackers and cookies. What makes Diamond Bakery crackers so unique? We only use time-tested recipes, pristine Hawaiian artesian well water, and hand-select each and every cracker we share with the world. To Diamond Bakery enthusiasts, we are comfort food. 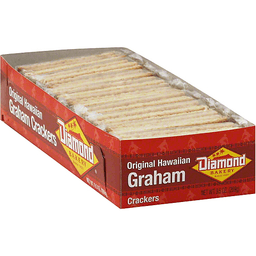 And though times and tastes may change, the care and aloha baked into our crackers will always remain the same. Sharing heartwarming aloha with the world since 1921. Please visit us at www.diamondbakery.com. Recycled. New. Since 1921. Naturally and artificially flavored. Diamond Bakery, named for the famous Diamond Head Landmark, is considered a flagship Hawaii company. 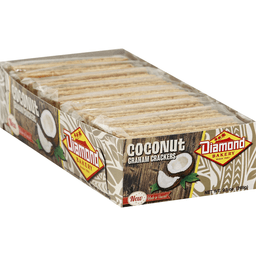 Founded in 1921, Diamond Bakery's mission is to share heart-warming aloha with people around the world through it's unique Hawaiian crackers and cookies. Over the years, Diamond Bakery products have become a key part of Hawaii's history and enchanting culture. Recycled. Please visit us at www.diamondbakery.com. Made in Hawaii! Nabisco Honey Maid Fresh Stacks Honey Grahams. New look! Same great taste. Made with real honey. 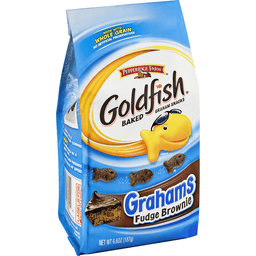 8g of whole grain per 30g serving. No high fructose corn syrup. 6 fresh stacks. About 8 crackers in each stack. 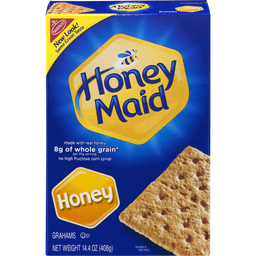 Smaller stacks that make it even easier to enjoy great, fresh-tasting Honey Maid grahams wherever you are! Perfect for at home or on the go! Whole grain. 8 grams per serving. wholegrainscouncil.org. Eat 48g or more of whole grains daily. 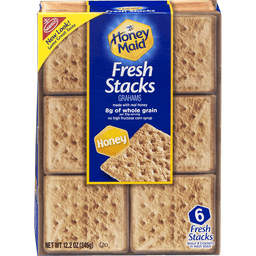 Honey Maid grahams fresh stacks contain 8g of whole grain per 30g serving. Nutritionists recommend eating 3 or more servings of whole grain foods per day (about 16g whole grain per serving or at least 48g per day). Keep it going. 100% recycled paperboard. Please recycle this carton. Minimum 35% post-consumer content. Mondelez International. Please have package available. Visit us at: honeymaid.com. 1-800-622-4726. ©Mondelez International Group. Natural flavor with other natural flavor. No artificial flavors or colors. 8 g of whole grain per 30 g serving. No high fructose corn syrup. 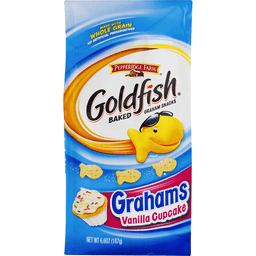 Per 23 Pieces: 130 calories; 0 g sat fat (0% DV); 90 mg sodium (4% DV); 7 g total sugars. New! Nabisco. Discover your world. Sweepstakes. National Geographic Kids. Enter for a chance to win a family expedition. Enter for a chance to win a 8 day National Geographic Family Expedition for 4 to Grand Canyon, Zion, and Bryce Canyon National Parks. Stay in historic park lodges and take part in activities geared for explorers of all ages. 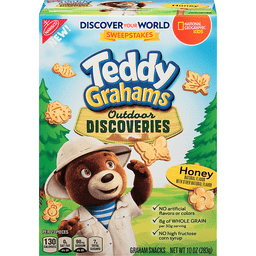 Visit the website www.natgeo.com/teddysweeps for a chance to win. 8 day. Guided adventure for 4. People of all ages. No purchase necessary to enter or to win. Sweepstakes starts on May 1, 2018 and ends July 30, 2018. Open to legal US residents of the fifty (50) United States and DC who are 18 or older. Void where prohibited by the law. To enter visit www.natgeo.com/teddysweeps. Odds of winning depend on the number of eligible entries received. See official rules of complete prize description and full details. Teddy. Ladybug. Flower. Leaf. Bumblebee. Butterfly. SmartLabel: Scan for more food information. 8 g of whole grain per 30 g serving. Nutritionists recommend eating 48 g or more of whole grains throughout the day. Visit us at: snackworks.com or call weekdays: 1-800-622-4726. Please recycle this carton. 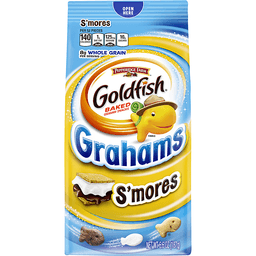 Baked graham snacks. Friends. Honey, chocolate & chocolate chip. Go organic! 12 snack packs. USDA organic. Certified organic. Made with goodness! No artificial flavors, synthetic colors or synthetic preservatives. No high-fructose corn syrup. Non GMO Project verified. nongmoproject.org. Box Tops for Education. Certified organic by Oregon Tilth. We work with trusted suppliers to source only non-GMO ingredients. We love to hear your feedback! Contact us at Annies.com or 1-800-288-1089 and reference the best flavor by date. 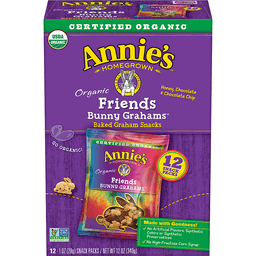 We reduce our bunny footprint by using: Certified 100% recycled paperboard. Recylcable: Minimum 35% post-consumer content. Please reduce your footprint, too! Recycle/reuse this box. how2recycle.info. Visit Annies.com to learn about our products and our commitment to a better planet - and to get a free think organic sticker. Think organic. Organic makes a difference! Certified organic food is produced the way nature intended - without toxic, persistent pesticides, synthetic fertilizers, GMOs, antibiotics, or added growth hormones. By choosing certified organic products, you are helping to enhance soil and water quality, improve habitats, conserve biodiversity, and support organic farmers.